only took him farther, out beyond the pale. All truths he discovered, he shared to no avail. When he tried to hit the mark, why did he always fail? Call him an outsider. Throw him into jail. Form the boards into a cross. Hammer in each nail. Set him adrift to flounder with no scoop or pail. Let him use his own hands if he needs to bail. Put him on the pillory. Bring out whip and flail. Bind him up and gag him lest he tells his tale. Instead of seeing different truths, it’s best you wear a veil. No telling if you listened, your own truths might just pale. Fresh new winds are often perceived as a gale. Manna sent from heaven to others is just hail. get your harpoons ready. You must insure they fail. the whole world falls silent when you find their trail. you may find the answer the outcast tried to tell. Grasp those truths you find yourself and live by them as well. This entry was posted in Poem and tagged daily addictions, poem about prophets, Reblog, Reblogs of my poems, solitary on October 10, 2018 by lifelessons. 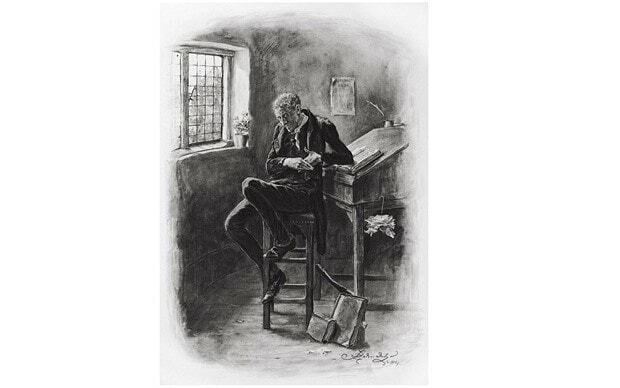 Uriah Heep–an unctuous, cringing, overly-humble character from Charles Dickens was chosen by the British Telegraph as one of their favorite Dickens characters. I chose him as well for a meeting with another rather hard-to-take notable fictional figure way back at the beginning of my blog. Few people read that silly poem that chronicled the meeting between Heep and Rocky Balboa. HERE is a link if you’d like to take a peek back at it. The WordPress prompt today is bestow. This entry was posted in Humor, humorous poem, Poem, Poetry and tagged Daily Post, Daily Prompt, poem about Dickens characters, Reblog, Reblogs of my poems, Rocky Balboa, Silly Poems, Silly Rhymes, Uriah Heep on April 24, 2018 by lifelessons. These bracelets, which I have on today, brought to mind this poem from two years ago that deals with (or at the very least, makes use of) today’s prompt word of “dubious.” I lived and traveled for many years abroad..a number of those years spent in Africa or traveling through Indonesia and this poem always reminds me of the thousands of artisans I met during those years, not knowing that later I would become an artisan myself. bright green, pink, white, black, green. They do not touch the yellow. to be carried away as well. given in December by the missionaries. who would wear these bracelets. A penny each, they are given for their efforts. This entry was posted in Uncategorized and tagged Daily Post, Daily Prompt, dubious, Reblog, Reblogs of my poems on November 14, 2017 by lifelessons. I must admit, I had totally forgotten writing this poem, which is about 3 years old. If you’ve been writing blogs for awhile, I heartily recommend that you go back and read some from three years ago or older. You will probably be surprised––like reading something someone else has written. Or perhaps your memory is better than mine. At any rate, hope you enjoyed this again if you’ve been following for that long and for the first time if you haven’t. This entry was posted in Poems, Uncategorized and tagged Luddite, Reblogs of my poems on May 6, 2017 by lifelessons.